Jeremy Pringle — musician, wine writer, punk, aesthete, friend — died peacefully in his sleep this past weekend. A memorial service will be held at 2pm, Friday 15th August at Taringa Baptist Church, 36 Morrow Street, Taringa. “And even in our sleep, pain which cannot forget falls drop by drop upon the heart, until in our own despair, against our will, comes wisdom through the awful grace of God.” — Aeschylus. The craziest wine region in the world? 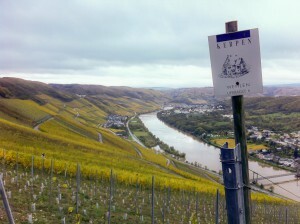 I sentence anyone with romantic notions of wine production to a harvest in the Mosel. There’s no doubt the last three weeks, spent occasionally in the cellar here at Weingut Kerpen but mostly on the slopes of the Wehlener Sonnenuhr, Graacher Himmelreich and, most distressingly, Graacher Domprobst vineyards, have been the most physically demanding of the year. Two days after the completion of the harvest, each morning is a process of unfreezing various joints and muscles that, I am tempted to think, have been permanently damaged. I’m grateful, however, the various cuts on my hands and arms inflicted by rogue secateurs and blackberry bushes have, for the most part, stopped bleeding. You’ve probably seen the photos: vines rise scenically above cute German villages that look to have strayed in from a fairy tale. I’ve not seen any witches on my visit so far, but there’s certainly a moral to the Mosel story: this is no sane place to grow wine. One has to walk the vineyards to adequately appreciate how steep they can be, and how difficult it is to simply make one’s way from top to bottom without the added complication of trying to pick fruit. And yet, vines have graced the south-facing slopes here for two thousand years, as ancient a tradition as any New World winemaker might wish for, proving at the very least that crazy vignerons aren’t a new invention. This is an extravagantly old-fashioned wine region, from its viticultural methods (still predominantly close planted vines, one plant per post, cane pruned in the shape of a heart) to the magnificent wineries that grace the banks of the Mosel in Wehlen, Bernkastel and Graach. The wines are old-fashioned too, gloriously so in my opinion, with few concessions to fashion or varietal diversity. Sure, there’s some Spätburgunder planted here and there, along with a smattering of Müller-Thurgau, but the point of the Mosel is Riesling in its spectacular diversity of expressions. Wine here is an interesting counterpoint to that from Burgundy. The Burgundian model of wine has had a far-reaching influence in terms of shaping how many other regions, especially in the New World, conceive the winemaking enterprise. The primacy of terroir, the exaltation of single vineyards, the ostensible erasement of the winemaker; one site, one expression, minimal “intervention.” German Riesling is different. For a start, vineyards like Wehlener Sonnenuhr are vast and contain many sites of differing grades. Although generally regarded as having some defining characters, these mega-vineyards are simply a starting point for a winemaker-driven range of expressions: dry, half-dry or sweet, ripeness levels like Kabinett, Spätlese, Auslese, Beerenauslese, and so on. These aren’t pseudo-natural, “just leave it and bottle the results” wines, they are a complex matrix of styles enabled by the vineyard and mediated by the winemaker, often requiring simple but highly interventionist winemaking (most notably, stopping fermentations part-way through). How refreshing: a wine culture that acknowledges both the importance of the vineyard and of winemaking. It’s this integrated view of winegrowing that prompted Martin Kerpen to send me out to the vineyards to pick. In a series of fascinating conversations, we have discussed the relationship between vineyard and cellar, and how some wine cultures separate the two more than others. His view is unequivocal: winemaking is inseparable from viticulture. Although my formal training presented me with two quite separate disciplines, and my experiences this year have been firmly cellar-based, the wisdom of Martin’s view has slowly dawned on me as I’ve moved between vineyard and cellar, first picking then processing fruit. I find, now, when I taste each batch in the cellar, I know how the fruit looked in situ, what the vineyard was doing as we harvested, the trellising used, the crop load, variability within the site, and so on. It’s a view I’ve not had of any parcel of fruit until now, and it’s fascinating. Of course, I’ve tasted widely and often since arriving here. I was already a big fan of German Riesling, hence my desire to work in the Mosel, and my appreciation for the wines has grown substantially over the past few weeks. They are, at their best, sublime, spectacular wines. What has shocked me most, I think, is how well, and how slowly, the wines age. They develop a set of flavours quite different from South Australian Riesling, shunning overt toast and honey in favour of a slow transformation that shaves the wines of their highly floral aromas and further emphasises fruit richness and minerality. Minerality is a key term when approaching these wines, and as a descriptor is often used by local vignerons to indicate a separate element from either fruit or structure; a third component of wine, if you like. I don’t think there’s anything magical about the mineral flavours in these wines, but they are most certainly there and are a key balancing element. If there is anything magical about Mosel Rieslings, it’s in their balance. For example, wines with over one hundred grams of residual sugar taste only off-dry and finish cleanly, yet with the most powerful, luscious fruit on the mid-palate. This is a trick I’m repeatedly astonished by, and I’m keen to learn the magic from Martin. I’ve been conscientiously tasting ferments as they take their course, and we will soon begin arresting ferments. Martin does this mostly by taste, and I’ll be tasting alongside him, training my palate to recognise the right moment. It’s truly nuts here: the vineyards are insanely steep (and even more insanely beautiful), the complicated system of quality classifications surely invented by a committee of lunatics. Most of all, though, the wines are wildly, crazily, fittingly beautiful. 75% Tempranillo and 25% Touriga Nacional. This wine is particularly interesting to me because it’s a blend of the two red varieties that seem to be emerging in this part of Texas as the most promising viticulturally and when vinified. In fact, more than one winemaker here has called Tempranillo the red grape of Texas. All this on the basis of a very few years’ experience; I guess the results have been pretty striking. This isn’t without challenges; for starters, neither grape is typically as cuddly as Syrah, nor as immediately understandable as Cabernet Sauvignon. Both can be savoury, angular and meaty, with fairly demonstrative structures. Things become interesting, though, when you place these characters up against Texas terroir, which tends to produce lighter, more elegant wines. I reckon the Sandstone Cellars IX is a pretty good demonstration of what happens. This is indeed a medium bodied wine, its colour wanting a bit for density. So far so typical. Then you smell it and are struck by how demanding this wine is. There are few concessions to inexperience here; this is a stridently angular, adult wine, full of umami-type aromas like soy and roast meat, along with sweet tobacco and snapped twig. There are occasionally hints of bright red fruit that tease one by shining clearly then quickly disappearing into the wine’s mesh of savouriness. In the mouth, a repeat of the aroma profile’s predominantly savoury notes, with lovely fruit (dark this time) and sweet, sweet tannins. Indeed, this is a very structured wine, and despite its vintage shows no obvious evidence of bottle age. The aroma’s tensions resolve nicely in the mouth, and I particularly like the way flavours bounce from slightly sweet to firmly savoury and back again. There are certainly more approachable wines in the Sandstone library, as there are in tasting rooms throughout this region, but for distinctiveness of character this is second only to the Sandstone Cellars III. Note: I am currently an intern with Don Pullum, the maker of this wine. One of the more puzzling experiences of my recent tasting foray into Russian River Valley (and more specifically Green Valley) wine has been the stylistic diversity and, at times, highly variable quality of Sauvignon Blanc produced in the region. It runs the gamut from Kiwi-inspired styles to insipid dry whites to this Merry Edwards wine, stylistically by far the most resolved of any I have tried from the region. I was quite looking forward to visiting to Merry Edwards Winery, it having received some solid recommendations, but nothing could have prepared me for the brutally efficient cellar door experience, which is as close to a drive by tasting as I have seen. The wines, though, were without exception intriguing, and by far the best of my day’s tasting in Green Valley. A Pinot specialist, the portfolio contains several single vineyard Pinots and this one Sauvignon Blanc. After extended tasting, some of the 2010 Pinots made less of an impression than they did at first, fading rather more quickly than I thought they might, but this wine impressed from beginning to end. It’s a multi-clonal blend, including 20% Sauvignon Musqué, that is barrel fermented and aged with lees stirring to build weight and texture. What pleases me about it, though, is that it retains outstanding freshness and character; that is, it always plays to the variety’s strengths. The nose is quite pungent, with aromas of tropical fruit and sharper gooseberry. It’s fresh but rounded, lacking the sharp bite of a Marlborough style. In place of this incisiveness is a smoother sense of generosity and greater complexity in the form of some mineral edges and fresh herbs. In the mouth, this is happily acid driven but with a fullness on the middle palate that softens some of its linearity. Tropical, herbal, mineral flavours echo the nose, with some good weight and texture through the after palate. This has good line and surprising length for the variety. It’s not particularly funky in flavour or texture, but it has oodles more interest than a more straightforwardly made wine, and I feel this is a particularly good style for Sauvignon Blanc if one is to turn one’s back on the highly aromatic, stainless steel approach. Good fruit, obviously, and particularly well handled. I tasted this alongside the Tyrrell’s 4 Acres from 2006 and, although the younger wine provided more satisfaction, it was nice to see two distinctively regional expressions of Shiraz at different points in their lives. On the nose, intensely tertiary notes of leather, sweat, spice and the sort of fruit that has become liqueur-like moments before it vanishes altogether. The aroma profile reminds me of how confronting older wines can be; while completely sound, this smells so odd, so unlike one’s idea of wine, that it may well send some drinkers fleeing to the nearest bottle of Pepperjack Shiraz. I love, though, the distinctively leathery notes this wine throws from the glass. The palate is harder work because it has lost just slightly too much fruit through the after palate to mask its (still quite prominent) acid. There’s still pleasure here, though. I especially like its flow through the mouth. Up front, surprisingly fleshy, with leathery, spiced flavours and that residual dark berry fruit. The mid palate shows some purity before it begins to fall apart through the after palate. Flavours aren’t perfectly integrated, and there’s some oak that, for me, sticks out a bit. But this is an old wine, on its last legs really, and one oughtn’t be too impatient with its imperfections. There’s a point during vintage at which things seem to click. Everyone knows what to do, any quirks in the equipment have been sorted and things just happen, even though the team is tired and a tad over it. It’s a nice moment to reach, and I felt able to move from a focus on learning basic operations to actually looking at each wine, its progression and how it might compare to other ferments in the winery. Overall, the vintage was characterised by a stop-start rhythm, fruit arriving in waves based on a weather pattern that alternated between scorchingly hot and messily rainy. I saw no parcels of fruit that came in before full flavour ripeness, so although the weather was a bit tricky, everything seemed to fall into place in terms of being able to pick at the right time. Shiraz came in first and was generally full and generous, parcels varying quite a lot in fruit character but everything seeming of good quality. Then Cabernet arrived (more of which later) along with Grenache and Mataro. Some more unusual varieties also passed through the Geddes winery, notably a parcel of Nero D’Avola destined for the Brash Higgins NDV label and some Petit Verdot right at the end of vintage. One thing I’ll be doing more of in future is branching out from McLaren Vale Shiraz into the wonderful Cabernets, Grenaches and Mataros it can produce. I do love the region’s Shiraz for its generosity and plummy flavour profile, but I saw so many parcels of great fruit of these other varieties that I feel they are due greater attention. Cabernet Sauvignon in particular was a surprise. I’ve enjoyed some McLaren Vale Cabernets in the past but have always tended to reach for Coonawarra or Margaret River when looking for great Aussie Cabernet. Although the Vale’s expression of this variety is quite different, I saw some really exciting, varietal fruit come in and it has reopened my eyes to the potential of this variety in the region. Fruit from Blewitt Springs, with its sandy soils and cooler climate, was especially fragrant and intense. A lot of winemakers in the Vale are excited by Grenache and Mataro, although there’s more stylistic divergence between makers when it comes to Grenache in particular than for the other red varieties. It ranges from a fragrant, Pinot-like wine to more Shiraz-inspired expressions. The best ferments I saw seemed to fall between these extremes, preserving the fragrance and bright fruit of the variety while ensuring sufficient density, intensity and structure. Mataro continues to baffle me a little. It’s talked up a lot amongst wine writers and makers and, to be fair, I’ve had some really nice Aussie Mataros, but its dark, challenging flavour profile will have a hard time stealing the easy drinking crown from Shiraz. No matter; it’s a variety worthy of attention and I hope makers in the Vale continue to experiment with it, in blends and on its own. Outside of the fruit, I developed enormous respect for the team I was working with and feel very lucky to have done vintage with them. Dowie Doole’s winemaker, Chris Thomas, managed a hectic vintage without really breaking a sweat. I love it when people move through stressful, constantly changing environments with seeming ease and Chris has that talent. He patiently showed me all the required cellar operations (sometimes more than once) and did so with clarity and patience. What a great teacher to have. Tim Geddes, in whose winery we worked in most days, is even more laid back and assembled a spectacularly fun and diverse vintage team comprising Julian Forwood, Tina Deng and Jack Christie. I’ve not laughed so hard in years. I’ve written about Amanda Geddes’s lunches before, and these provided pleasure and sustenance right to the end. Time outside the winery was also fantastic, albeit necessarily limited. McLaren Vale is a real gourmet area and my host, Leigh Gilligan, ensured I was able to experience most of what the region has to offer in this regard, including via his own delicious cooking. It always mystifies me when wine regions have no food culture; when these things come together, as they should, pleasure is exponentially increased. A particular highlight was seeing Lulu Lunn, partner of Dowie Doole’s charming Drew Dowie, stretch mozzarella and hand me a portion, all warm and fresh and juicy. What a pleasure. I’ll be popping back in early May to have a look at the wines we made, most of which will be in barrel. I’m fascinated to see what’s changed, how malolactic fermentation has affected each wine, which parcels have remained my favourites and which will surprise me. So good was the experience that I feel strongly I’d like to do it again. Could this be the beginning of the end? I’m in Tasmania at the moment, enjoying as many local wines as I can. My hosts have arranged a big Pinot lineup tonight, but I’ve already sampled a couple, including this one from the east coast. In browsing the Freycinet Vineyard Web site, I was intrigued to see the winemaking notes indicate this, the winery’s premium Pinot, went through its primary fermentation in a rotary fermenter. Refreshingly new world. To the wine itself, good varietal character on the nose, showing a prettiness of fruit alongside significant spice and forest floor. Getting those balances right is an obvious challenge but it’s amazing how often wines can seem slightly off in the interplay of these basic elements. This, by contrast, seems to elegantly move from bright fruit to black spice to sappy notes and back. The palate, for now, is quite acidic and this overwhelms one’s impression of flavour a bit. There’s good flavour there, though, with reasonably intense red fruit and sap, backed up by spiced oak. Tannins take a back seat to acid, structurally, but they are prickly and textural when they make an appearance towards the back of the palate. Should the acid fold back into the wine, this may become a really elegant wine. The flavours are spot on. A very happy new year to all. To celebrate 2013, I’m in County Durham in the UK visiting a friend who happens to be an exceptionally talented cook. In between hearty English meals, I am tasting the occasional wine. I like to shop for wine in supermarkets while here, and this particular bottle was procured at Costco. Young Barolo can be a bit forbidding, and this is certainly a very structured wine at present. However, after a couple of days’ tasting, I think I have the measure of it. Unfortunately, it doesn’t seem the most elegant example. The aroma was initially quite muted; a day’s air, though, sees it somewhat more expressive. There are some recognisable aromas, tea leaf and red fruits, though it’s far from coherent. More like a moderately crazy goldfish darting in and out of the strands of seaweed in its too-small tank. The palate shows satisfyingly robust tannin and a set of flavours that provide more satisfaction than the nose. It’s bright and moderately intense, with a particularly clean middle palate. However, the elements never come close to expressing any sort of narrative, appearing to be placed randomly along the line. The tannins, too, while present, lack any sort of beauty of arrangement. Will this come together? I’m not sure; for now, it offers only intermittent pleasures. Seeing as it’s the season of good tidings and joy, I thought I’d give Full Pour the gift of more modern software and, if you can see this post, it means I’ve been successful in my efforts. Hopefully, migrating the site to WordPress will mean easier commenting, a more readable format and generally more awesomeness. As ever, the site remains more about words than “look,” though I hope over the coming weeks and months it will gradually evolve in structure and appearance. In particular, I’m working my way through older posts to ensure correct formatting. Stay tuned for further tweaks. We’ve just migrated Full Pour to a new hosting account, which should increase the site’s performance and general awesomeness. Nothing should have changed otherwise, but if you do notice strange behaviour, please drop me a line! I’m struggling with a cold at the moment, so tasting hasn’t been on the agenda. Hope to be back into it soon, though.